Home/FED Holds Rates – The Truth about its Policy – Gold & Silver Rise. Today is Thursday 31st January 2019 and we are commenting on the FED’s decision not to raise interest rates and FED Chair Powell’s statement during the Press Conference. So that we could see and comment on how amateurish and or biased some of the talking heads are who have given such commentary. Blah blah blah blah blah and some of our favourites did just this but they shall remain nameless – You Know Who they Are! Now we are producing this video for all of our listeners because whether you are a paying member or not, we want you to benefit from this and hopefully so that you can understand our reasoning behind what we say. In future, our Free videos will be less comprehensive, accurate yes, useful most certainly, but less detailed while our inner sanctum videos will be more substantive – after all those members are paying for the information and we, quite rightly have a duty to provide excellent value for that money. That said, let’s now discuss what is really happening and you are hearing it from people who have sat at the discussions with Central Banks in the past (and not just shouted from the side-lines outside) and who understand their motivations and interests and pressure points. So, tighten up, here goes, it going to be a long one. To reach and maintain moderate long-term interest rates. In achieving the above legislators believe that the FED will succeed in promoting a strong US economy. Open market operations – the buying and selling of government securities to the open market, thereby achieving the most favourable price – and provides it with great flexibility which is why this is often the favourite tool. The Discount rate – this is the interest rate charged by Federal Banks to depository institutions on short term loans. Reserve Requirements – these are the portions of deposits that banks must maintain either in their vaults or on deposit at a Federal Reserve Bank. Now the announcements on interest rates are made and decided upon by the FOMC (The Federal Open Market Committee). It meets eight times a year in Washington, D.C. At each meeting, the committee discusses the outlook for the U.S. economy and monetary policy options. The voting members of the FOMC consist of the seven members of the Board of Governors (BOG), the President of the Federal Reserve Bank of New York and Presidents of four other Reserve Banks who serve on a one-year rotating basis. All Reserve Bank Presidents participate in FOMC policy discussions whether or not they are voting members. The chairman of the Board of Governors chairs the FOMC meeting. As already mentioned, The FOMC typically meets eight times a year in Washington D.C. (though by Law it only has to meet 4 times a year but they have met 8 times a year since 1981). At each meeting, the Committee discusses the outlook for the U.S. economy and monetary policy options. By tradition the Chairman of the FOMC is also the Chair of the Board of Governors and the current Chair is Jerome Hayden Powell who is 66 years old next Monday. For clarity, the seven members of the Board of Governors of the Federal Reserve system are nominated by the President and confirmed by the Senate. The FED Chair is appointed for a 4 year period which of course can be renewed. Members of the board of Governors serve 14-year terms, running on a staggered basis. This ensures a degree of continuity as well as maintaining their independence from political influences and threats. Since 1979 the FED Chairs have been Paul Volcker, Alan Greenspan, Ben Bernanke, Janet Yellen and since 5th Feb 2018 Jerome Powell. It should also be noted that while the President appoints the Fed’s Board of Governors, including the Chairman, the Central Bank “derives its authority from the Congress, which created the System in 1913 with the enactment of the Federal Reserve Act,” at least according to the FED’s website. If this is the case, the thought that people believe Powell is frightened of being fired by Trump is ludicrous and the worst that Trump can do is not re-nominate him after his 4 year term but he would then still remain a Governor. So now we have put all of this into context, in summary, the FED obtains its power from Congress, is nominated by the President and confirmed by the Senate, have 3 main monetary goals to achieve and essentially have 3 main monetary tools to achieve those goals. It has no control or responsibility over whether the Government cuts or raises taxes, it has no control or responsibility for the level of the stock-market and it has no control or responsibility for Government spending. With one caveat – one caveat – it can give advice, express an opinion and adopt such monetary measures which may counter-act any of those mentioned policies in order to maintain economic stability. In other words, if the Government goes on a spending spree or drastically reduce taxes, they can raise interest rates to counteract this if they so wish or may be compelled to do so by the markets reaction to such policies. One final point again not mentioned by conspiracy theorists or to be more accurate is skewed by conspiracy theorists who claim that the FED is a private corporation only looking after the bankers and its own interests. The reality is that The Federal Reserve is actually a nonprofit company. After its expenses are paid, any remaining profits are paid to the Department of the Treasury. The Department of the Treasury then uses that money to fund government spending. The Federal Reserve System contributed over $80 billion to the Treasury in 2017, according to the Federal Reserve Board (FRB). So, the Federal Reserve not only helps to make and implement policies via funding mechanisms and payment systems, it also serves as the government’s bank and generates a portion of the revenue used to fund the country’s activities. So now let’s take a look at yesterday having put the FED into perspective. Officials also issued a separate statement addressing the balance sheet, saying they expect to operate with “an ample supply” of bank reserves. “The case for raising rates has weakened somewhat”…… I would want to see a need for further rate increases,” adding that inflation would be key and that the funds rate is “in the committee’s” range of a neutral rate estimate, a key measure for the Fed. Also causing some concern for the Fed are geopolitical issues like the ongoing Brexit negotiations and an economic slowdown in China. The FED wanted to normalise Interest rates and reduce its balance sheet as quickly as possible while the economic situation would allow this to happen. In other words, to get rates up to 3% – 3.5% and eradicate its $3.5 trillion balance sheet debt. Now we have said repeatedly we could see them just about reach 3% if they were lucky and were never convinced it could eradicate the debt. Having said that, the jobs picture was looking good, GDP was well above 3% the US dollar was strong, and the Stock markets were rising, albeit too fast. So, this looked like a possibility or was certainly worth aiming for. Then we began to see a number of “conflicting currents” to use Powell’s words. Trump’s trade conflict with China in particular was harming US industry short term, China and Western Europe have been announcing and warning of lower growth figures, the US Government shut down will reduce US first quarter GDP which would be sustained if there is another announced in a couple of weeks and corporate earnings, whilst variable, have had a few notable disappointments. In addition, car sales have been poor and geopolitical tensions once thought resolved are slowly resurrecting e.g. North Korea, ISIS and Syria. So all in all, one can see why the FED has changed its view with regards to Interest rates and balance sheet run off. In fairness, the FED has said all along, that whilst the equivalence of quantitative tightening was its aim, it would always be data dependent and we believe its current actions are indeed adhering to this policy. 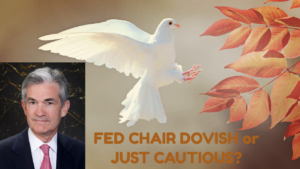 For some of the talking heads to condemn the FED for changing its direction or at least stalling its momentum, is very unfair as those same talking heads were criticising it for maintaining its previous position – they seem to want it all ways. Let’s once again not forget, the FED’s aim is to obtain maximum sustainable employment and achieve stable prices and whilst we can all debate the true rate of inflation, we can certainly accept we are not witnessing the levels of hyperinflation experienced in Argentina and most certainly unlike that experienced in Venezuela. So frankly, whilst we must all accept that policy makers cannot answer every hypothetical situation or give away all of its secrets, we, having listened to his comments and answering questions and reading accompanying literature actually believe that the FED is being as transparent as it practically can. Its going to be accommodative in so far as the data suggests. Powell has also left wriggle room to raise rates or increase his balance sheet run off should the economic data be surprisingly more positive than envisaged, though we can all hear quite clearly that certainly for a number of months ahead we are more likely to see more of an accommodative stance as opposed to a tightening one. Shortly after the announcement and comments, we saw a dramatic rise in Stock markets with the Dow closing eventually up 434 points at 25,014 the Nasdaq up 154 points at 7,183 and the S&P 500 up 41 points at 2,681. Asian markets have generally opened and closed in positive territory and European markets are mixed but with no substantial moves in either direction. At the time of writing, the dollar index is down o 95.29 but is still a little stronger than we thought it may have fallen to. Gold is currently standing very close to our prediction at $1,323 and silver has surpassed the psychologically important $16 level again as we said it would and is standing at $16.11. The markets are currently digesting the news and crunching the numbers. Gold and silver are on a positive trajectory, and technical analysts quote that a move above $1328 will rapidly move gold up to $1337 (June 14th top) and silver markets now having surpassed $16 could indeed have a relatively clear run up to or near the $16.50 level though this may take a few days. That said, there is some caution to be expressed. Namely China and the US are completing their 2 day trade negotiations today and if the news is positive, we may see the dollar strengthen and a reversal in gold and silver prices. Equally if there is no news then the opposite may indeed occur. We must also not forget that other currencies too are in somewhat difficult, sterling over Brexit and the Euro over trade outlook and therefore relatively speaking these too could have an impact on the dollar index as it represents a basket of these currencies in relative terms. So, what is our prognosis for February. Well we are finalising our analysis, but currently in Euro, Sterling and Dollar terms both gold and silver look as if they have quite a positive outlook, certainly over the next 2 weeks. We must not forget of course they have already received quite a good run so far, however any sign of further bad economic news will tend to cause their price to increase further. We have also spoken with a number of Investment banks and whilst they are regarding yesterday’s FED statement in a positive light and markets have responded accordingly, they are apprehensive about the trade talks, Trump’s continuing shut down threats, and even more importantly more poor economic earnings figures coming from major companies and today’s announcement that Italy is now formally in recession. Many are holding their breath to see if stock markets can hold this gain or will reverse gear in coming days and continue its descent further.